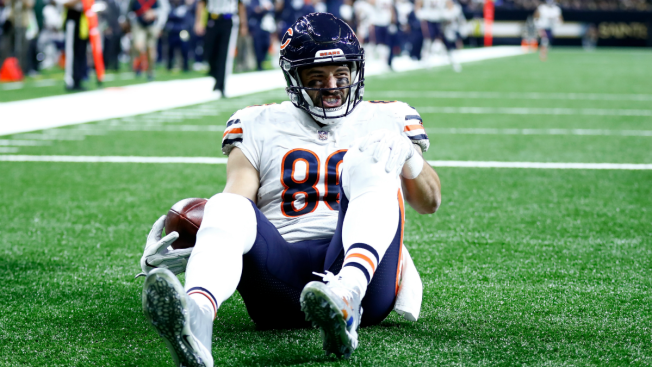 Chicago Bears tight end Zach Miller was carted off the field after suffering a horrific injury in Sunday’s game against New Orleans. With the Saints leading 14-3 and just under six minutes left in the third quarter, Miller leaped up in the end zone to catch a 25-yard pass from rookie quarterback Mitch Trubisky. Miller stayed down on the field as medical personnel attended to him, before being carted into the locker room and eventually ruled out for the rest of the game. Adding insult to gruesome injury, officials then overturned the call on the field, determining after review that Miller did not make the catch and ruling it an incomplete pass. Head coach John Fox said following the Bears’ 20-12 loss that Miller dislocated his knee. He was taken to the hospital for further evaluation, Fox said, though there was no official word on the severity of the injury, or how long he may be out. Sunday’s incident is the latest in a long history of injuries over Miller’s nine years in the NFL. Drafted by Jacksonville in 2009, he missed 12 games in 2011 with a dislocated shoulder. A calf injury sidelined Miller in the 2012 preseason, and the Jaguars subsequently waived him a short time later. Miller didn’t see the field once during an eight-month stint with Tampa Bay in 2013 that ended with his release following a preseason concussion. At the end of the 2013, the Bears signed Miller to a futures contract – but he suffered yet another setback during a 2014 preseason game, this time a foot injury that landed him on season-ending injured reserve. He returned to the field in 2015 for the first time since 2011, appearing in 15 games during which he hauled in 34 receptions for 439 yards and five touchdowns. Miller signed a two-year contract extension with the Bears in March 2016, and later that year hit a career high of 47 receptions for 486 yards over 10 games before breaking his foot to once again end up back on injured reserve. Prior to Sunday’s injury, Miller had 20 receptions for 236 yards and two touchdowns over the first seven games this year. Guard Kyle Long and center Cody Whitehair also left the game early with hand and elbow injuries, respectively.